Frost Line Penetration Map In The U.S. The frost line is simply the deepest point in the ground to which ground water will freeze. It’s also referred to as the frost depth. When water changes from liquid to solid, it expands 9% in volume. This resulted frost heave can be detrimental to footings and foundations. That’s why building codes specify structural footings be placed below the frost line. Additionally, water and sewer pipes need buried below the frost depth. 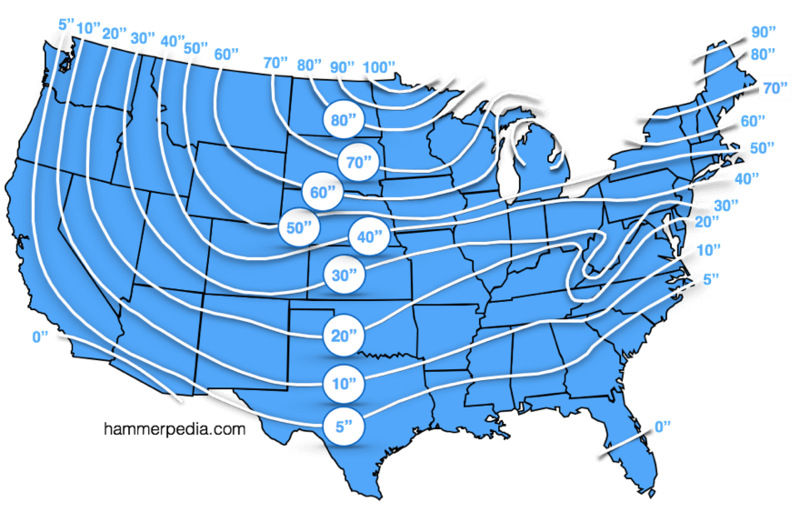 The frost line map below was drawn based on data from the U.S Department of Commerce. Keep in mind you local building official will be able to provide the most accurate information based on your particular area. Scroll below the map for even more detailed information.